If the Italians could have chosen any place on earth as their home it's doubtful they would have found one more blessed with such an abundance of resources with which to create exquisite food. No wonder they refer to it as 'Il bel paese', or the beautiful country. They are equally fond of il mare, the sea, which laps up along thousands of miles of coastline, and provides both fish and seafood of fantastic quality. 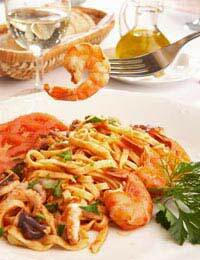 Many restaurants serve the signature dish frutti di mare, or fruits of the sea, but in truth it is all encompassing description that could be applied to the natural gift that has been bestowed upon the inhabitants of the peninsula. Summer visitors to the country's resorts will attest to the freshly grilled tuna and swordfish that only need a squeeze of lemon to accompany their meaty texture. Or perhaps a tomato sauce given an added taste of the sea through the addition of some anchovies. If the table happens to be in one of Liguria's eating establishments, it would be no surprise to see pesto make its presence felt. Then there are the mussels, rings of squid and plates of grilled sardines that break up the daily chore of sitting on a sun lounger listening to the wave’s tip-toe up the sand. Not to mention a late evening in the company of some vongole, or baby clams, peeping out from between the coils of a bowl of linguine. But with the changing of the seasons and a more bitter edge to the wind come those gutsy equivalents of peasant soup, the fish casseroles. Again, whichever port the hungry traveller happens upon, the safe bet is it will have a substantial pot containing the best recipe for fish stew in the entire country. Take, for example the Mediterranean coastline, home to the Livornese Cacciucco where clams and mussels, octopus, tuna and . . . well, whatever lands on the quay that particular day are fortified by the addition of fish stock and chilli peppers. Warms the cockles of your heart, as the Italians would probably say, that is if they could pull off a half-decent West Country accent. On the Marchegiani coastline of the Adriatic, the other side of the peninsula from Livorno, there are as many brodetti, or fish broths, as there are towns on the coast road down from Ancona. Again the locals throw in whatever is the catch of the day, for example mullet, crab, sole, John Dory, also known as St Peter's fish or San Pietro in Italian, and dogfish. But any discussion of the nation's fish dishes should not overlook the freshwater contribution from the inland lakes such as carp from Lake Trasimeno in Umbria or the tench, or tinca, that inhabit Iseo in the south of the Lombardy region, to name but two.But whether it's a well appointed terrazzo overlooking the calm waters of Maggiore, or the bustling promenade of one of the Riviera resorts, the Italians' sympathetic handling of one of the many fruits of the sea that surrounds them means that diners will fall for the charms of any menu hook, line and sinker.